Timbre in de klas op bezoek op uw school? klik hier! Wouldn’t it be cool if you could paint with your voice? That was our starting point for Timbre in the Class. 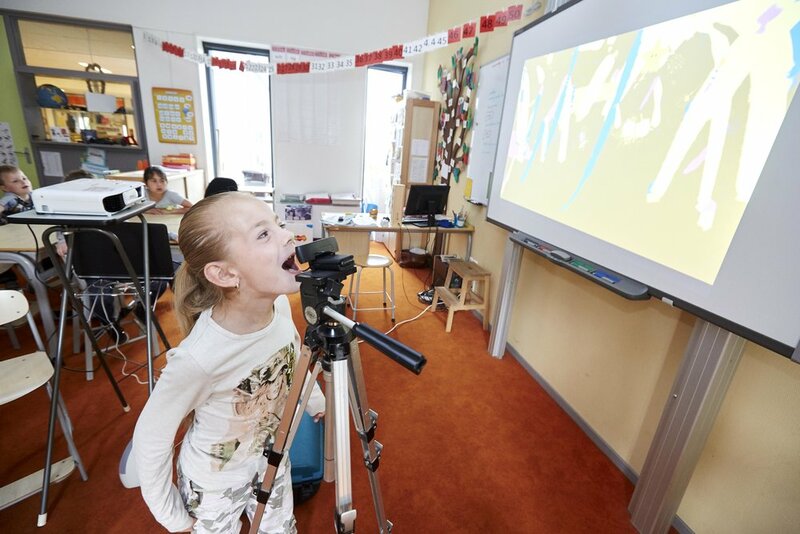 Together with art education partner Kunst Centraal we created this interactive installation which is focused on the youngest pupils at school. Using your voice in public can be a liberating experience, but doing it all by yourself in front of the class can be a little bit daunting. Our goal was to make crossing this barrier easy and even fun, by introducing several steps that give them the right feedback to explore their own voice. In this travelling installation the children (and teacher) are taken on a 30 minute journey by the coach and the virtual Conductor “Digigent”. It starts with breathing exercises followed by voice coaching to prepare the children for painting with their voice. Using the pitch, volume and length of the sound, the children paint abstract art with their voice. During this course the children will explore their own voice, harmonize together, and even visualize their own voice using pen and paper. With the endgoal being a greater awareness of your own voice. We are looking for partners to collaborate with in other areas than the provincie Utrecht.